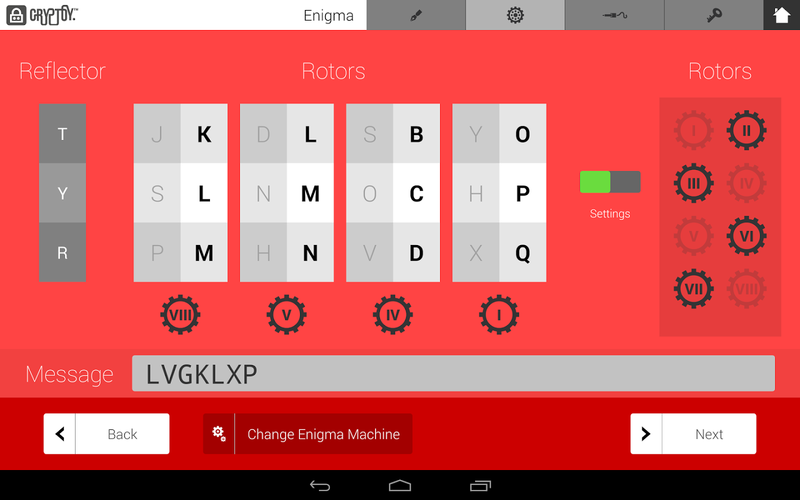 British intelligence agency GCHQ has today launched an app called Cryptoy that is aimed at teaching secondary school-age children (and their teachers) about cryptography. While it’s available freely for anyone with an Android tablet to download (no Android phones or iOS devices supported at the moment – but that’s scheduled for next year), Cryptoy is really aimed at Key Stage 4 students in the UK. Growing from a project designed for Cheltenham Science Festival, the app lets users learn about basic encryption techniques and their history, as well as letting you have a crack at creating your own encoded messages. Naturally, the idea is that these messages are then shared (via the usual channels) and recipients can use the app to try and decipher the hidden message. Regardless of whether or not the students pick up a specific interest in cryptography isn’t really the point here – it’s part of a drive to promote Science, Technology, Engineering and Maths (STEM) to students. Of course, if the UK becomes even the slightest bit more aware of crypotographic techniques and cyber-security skills, then that’s no bad thing either.